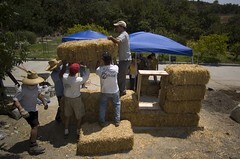 When it comes to home insulation and energy efficiency, a bale of straw may seem like something only the Amish do, but in fact, straw bale insulation has turned out to be an excellent green building element. In the class of unusual home building elements, is straw really a far fetched concept for insulation? Don’t worry, the big bad wolf is not going to blow this energy efficient home over. Straw bale homes are ultra sturdy, surprisingly fire resistant, and excellent at controlling the temperature in your home. So, how can a commonly underutilized, agricultural waste product be used to insulate your home and be green? 1.) Renewable– It’s a renewable resource which is typically composted or burned. 2.) Low Embodied Energy – Unlike manufactured insulation materials, straw is natural and non-toxic, plus it doesn’t require much processing and delivery to a building site. 3.) Less Wood for the Frame – Replacing “stick frame” walls with bales can cut by half the amount of timber needed in a modern home, reducing demand on forest resources. Ok, so it sounds like the ultimate ‘green’ building material, but wouldn’t it burn easily? Should a fire get started, lab tests and experience have shown that foam insulations ignite at low temperatures and release poisonous fumes, and wood studs and trim will burn readily. But straw bales, compressed and sealed with plaster, are starved of oxygen and resist combustion. Good news for your family, because if they do catch on fire, they merely smolder, allowing precious time for anyone inside to exit safely. Straw bale homes also have aestetics as well. Earthen plasters that cover and support the bales are used to give the home a very warm, modest feeling to your home. So what’s not to love about straw bale insulated homes? They’re renewable, energy efficient, and fire resistant. The three little pigs have nothing on the straw homes of today!